Create a reservation faster than ever, easily view or modify upcoming reservations, and get directions to your rental location. 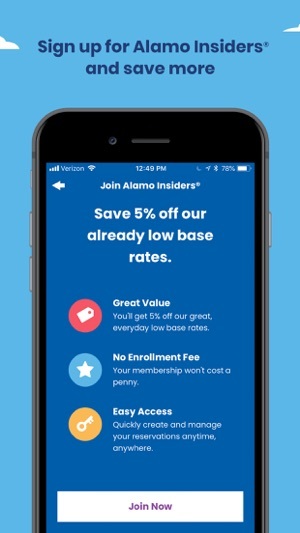 Stay signed into your Alamo Insiders® account to make reservations even easier and save 5% off our already low base rates. 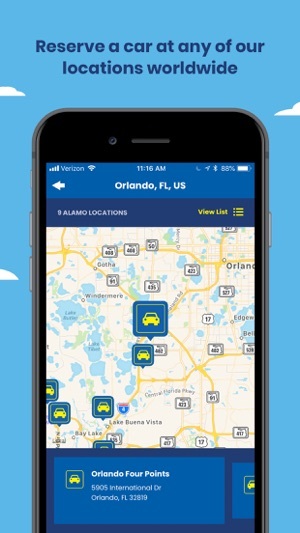 Find rental locations near you or your destination, narrow your search with vehicle filters, and save rental details to quickly reference them later. 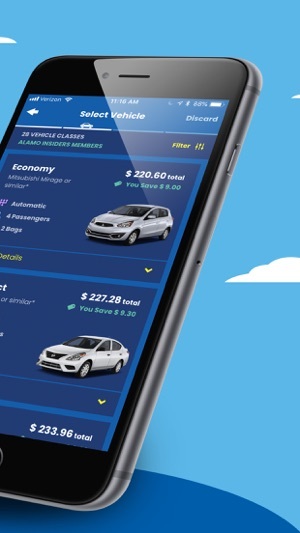 Easily view the details of your rentals to reference pick-up or drop-off times, your current rental car information, directions back to your rental branch, the closest gas stations and more. 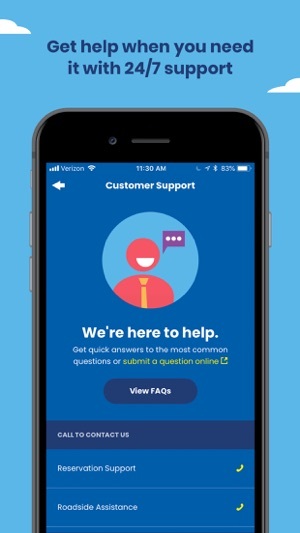 Find easy access to our most Frequently Asked Questions, contact our 24/7 customer support, or look up your location's rental policies to get the help you need to get you back on the road. We're there when you need us. 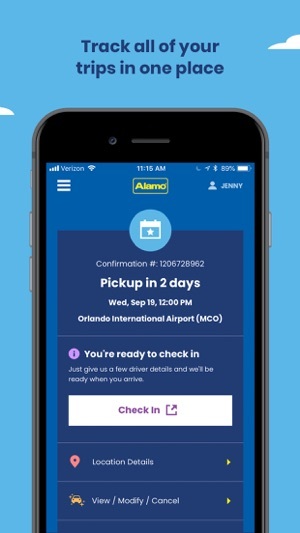 And now we're making it even easier to experience the benefits of Alamo from your mobile device. Get to the fun fast! Check-In to sprint through the rental process. Introducing the ability to save time at the counter when you check in on the app. Just give a few details now like your driver's license information and date of birth and we will be ready when you arrive. You'll be on the road and on vacation before you know it! I’ve used Alamo for years because them along with Avis where the only companies that did not require a deposit when using your credit card but the other day I go to Avis at the Atlanta Hartsfield Airport to Rent-A-Car and the lady tells me that now you have to pay $100 deposit wow so then I’m like OK I just need to take one day off because I did not know I had to pay a deposit so she then tells me well I can’t do that because now it seems like you don’t have the money to pay for the car so we can’t let you remake a reservation....... are yu serious I absolutely cannot believe this lady just said this to me after I just told her I did not know that a deposit was required so how in the world does that mean I can’t pay for the car she clearly needs not to work in customer service and she supposedly was the supervisor I was so ready to walk away from that counter and never returned to Almo that I failed to get her name but I will never ever rent another car from that company again Avis is my new home for my all my rental needs! Sends me to the website. What’s the use? The whole point of using the app is to make things fast and easy. I wanted to check in for my rental. But the app does not allow me to check in within the app and instead sends me to browser web page to do it. The browser then requires me to input all of my information manually even though I logged into the app using my Alamo account which already has my info. After entering my info manually, I was able to check in using the browser and then went back to the app where I had to re-enter my reservation number. After finding my reservation on the app, it doesn’t save it under my reservations so I have to do it manually each time. 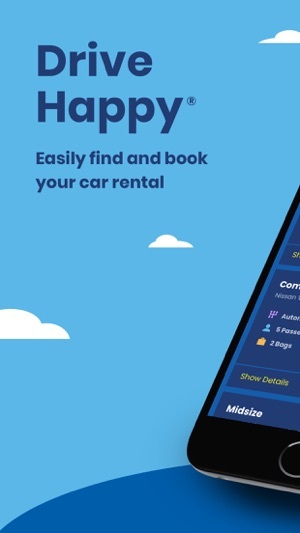 Very poorly written app. We always end up renting with Alamo after comparing prices. And we have had very good experiences with Alamo, easy pick up and return. Many locations allow you to select a car you like. The only drawback was lack of a convenience app on the phone but finally, it’s here! We immediately installed and logged in, boom, my upcoming reservation pop up! So far so good, app seems to be working fine. Copyright ©2018 Alamo. All Rights Reserved.